I have not made the full sandwich yet but this baked tofu is soo good! I baked it for longer than called for, part of that time at a lower temp and made a double batch. I love that you don’t need to press the tofu and the marinade throws together in minutes. DH loved it too! I’ll try this without all the oil spray and use some oil free bread to see how it comes out. I put some basil leaves from my garden. It was wonderful!!! I used Ciabatta bread to make this recipe. I think any hearty bread that can stand up to a lot of ingredients and a sandwich press would be perfect! What bread did you use for this recipe? 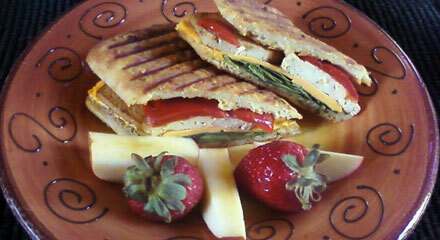 Excellent panini!!! WOW! After becoming vegan, a little part of my italian-pesto-loving-heart died. Until, this sandwhich! Mangia mangia!! I made everything exactly as described in the recipe and this turned out phenomenally well. I did pick up some onion foccacia from my local grocer and omitted the cheese. You do spend quite a bit of time preparing all the pieces of the sandwich. I ended up making a ton of pesto (not complaining) and marinated tofu as a result of my preparations. Fortunately, I was invited to a potluck pool party the next day and made a platter of the sandwiches with all the extra ingredients I had. The party was mostly omnis with kids of all ages and everyone loved it. I made these, and they’re great.Parchment paper eliminates the cooking spray dilemma.GF bread works well, too for those of you who need that option. Sooooooo good! Will make this weekly! I did not make the sandwiches but did bake some tofu using this marinade and it tasted great. Will definitely try the sandwiches when I have a bit more time. I made this for dinner tonight and it was amazing. Meat eaters loved it too. Thank you for sharing this one! Yummmm!!!! Can’t wait to make this. I’ve baked tofu before, sounds like a delicious idea!